Ladies, listen up. If you haven’t heard the saying, “The way to a man’s heart is through his stomach,” then you may be in trouble. Well, you may not be doomed, but trust me- growing up with 3 brothers, I know men love to eat! And let’s be honest, who doesn’t love to eat? Based on my first 2 posts, clearly I DO…so please read on. First up, a classic European dish: Stuffed Cabbage. 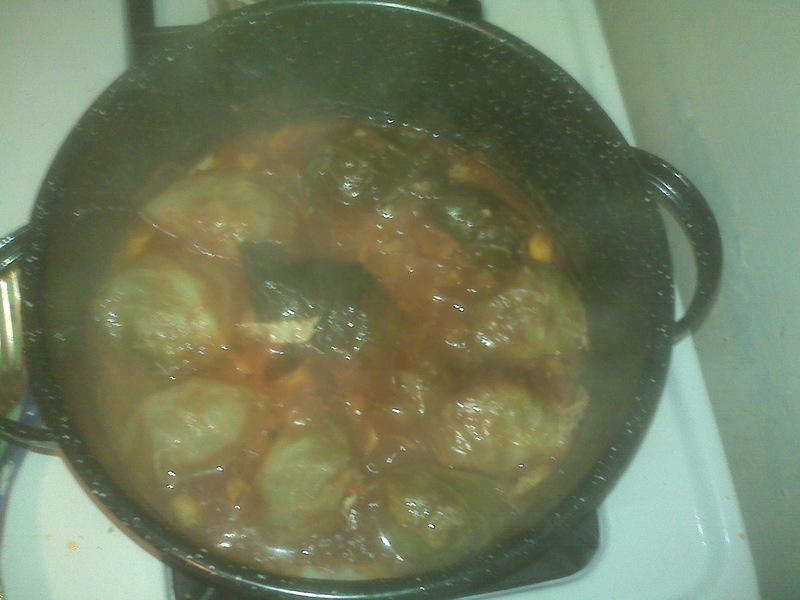 Stuffed cabbage is ground meat rolled up into boiled cabbage leaves. I like to think of them as “little packages of love.” Once you roll up your packages, they steam in a sweet and sour sauce that can be created in multitude of ways. My mom has a secret combination that is so simple and delicious. It’s simply delicious! Here are my “packages of love” steaming away in their sauce: recipe to follow. My photography will get better, I promise! But they do look delish. Remove the center core of each head of cabbage. Bring a large pot of salted water to a boil. Once boiling, add one head of cabbage. Check on the cabbage after 10 minutes, the outer layers should be soft enough to start pulling off. Pull off one leaf at a time and set aside. The inner leaves will need to boil longer before you can remove them, so keep checking on the cabbage while you prepare the rest of the meal. Meanwhile, dice the 2nd cabbage head so you have shredded leaves. Set aside. In a large bowl, combine the ground beef, breadcrumbs, eggs, milk, salt, pepper, garlic powder and onion powder. Mix well and form into balls. I make about 10 meatballs with 2 lbs of meat, but you can make them as big or as small as you please. Make sure you have enough boiled cabbage leaves per ball and once you do, discard the cabbage and water from the pot. Combine the jelly cranberry sauce and jar of chili sauce in the same pot over very low heat. This is crucial because if the heat is too high, your sauce will burn. Once the cranberry has melted, add the shredded cabbage leaves and cover. Cabbage is filled with moisture, so steaming the leaves in the sauce will create water. This is a good thing! Let the sauce and cabbage steam for about 10 minutes, or until the cabbage begins to soften. While the cabbage is cooking, begin preparing the packages of love. Place one meatball in the center and fold the sides in and roll up the cabbage so the meatball is tightly packed inside. Place the packages of love, seam side down in the big pot and cover (still on very low heat). Allow the packages to simmer for 1 hour and then serve. Saturday turned out to be a gorgeous day in NYC, so I wound up at the Hester Street Fair on the Lower East side. I could go to a street fair everyday- they just never seem to get old! What’s better than shopping and eating all within a block radius?!? I can’t seem to think of anything I would rather be doing. There were a ton of food options from pulled pork sandwiches, tacos and empanadas, edamame dumplings, burgers, gigantic pickles and mac n’ cheese… just to name a few. I’m sure you could imagine just how high my calorie intake for the day was. Given the title of this post, I chose to go with Luke Lobster. 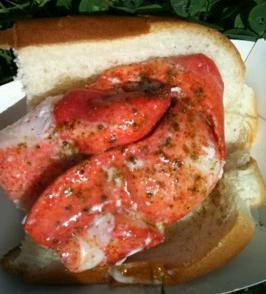 I have been dying to try a lobster roll for as long as I can remember. What we have here is shaved ice dessert drizzled with condensed milk. 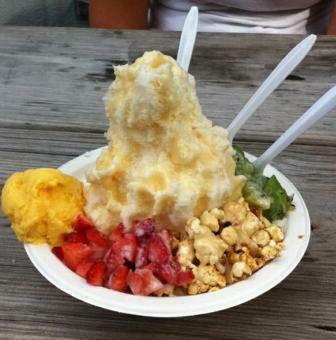 Surrounding the ice is mango sorbet, strawberries, caramel popcorn, and kiwi. It may sound like you can’t go wrong… but as I slowly started to dip into this creation, I couldn’t help but think about the condensed milk poured over the shaved ice. It was completely foreign to me, and blew my mind. I wasn’t sure how I was supposed to eat it! Do you take a bite of everything at once or individually? Do you decide your favorites and eat those together? There must be a simpler way to eat this… As it turned out, there’s not. I tried many/ if not all options but in the end, this was not my cup of tea. Update: When I got home later that day, I was so intrigued about this odd dessert, that I did a simple online search. What I learned is, that this is an authentic Taiwanese dessert. It may be their standard after dinner treat, but I think I’ll stick with a good ol’ fashion ice cream Sundae with a cherry on top for now! I was rooting for Jeff all along. I think what sold me about him was his sense of humor – nobody can beat that! Not even Susie’s chimichanga, enchilada, tortilla, frijoles loving self! 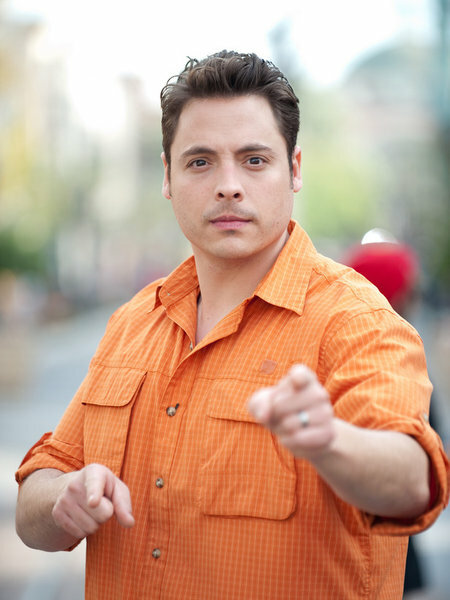 Be sure to check out his new show the Sandwich King this Sunday on Food Network! Like New York’s Restaurant Week, Miami has a similar promotion called Miami Spice, which is actually the whole month of August. It gives us food lovers a great opportunity to get fancied up and treat ourselves. This past weekend a few of us decided to try Symcha’s. Pronounced Sim-kkchhkkka’s – you know, how a Jewish person would say it. Which is exactly who the owner is – Mr. Symcha, a kind attentive Jewish restauranteur from Venezuela. Anywho, here is the rundown on the grub in a fancy slideshow. Served on top of a Himalayan Salt Block – ok let’s get real, that block is definitely not from the Himalayas but I appreciate the creativity. Tasty and I learned a new word – “Haricoverts” which is a type of green bean. The dessert is the money maker, you blow this you blow the whole meal. To me, a dessert called Death By Chocolate should have layers and layers of chocolate. And although it was a sweet morsel of goodness, I was in no way near death caused by chocolate. My boyfriend had the Tiramisu which I can’t say much about because it was tasteless compared to my coconut-mint-oreo-death-explosion.